Nordic Cooking is about preparing simple, hardy meals that are low-sodium, tasty and nourishing. None of the recipes call for even a touch of salt. 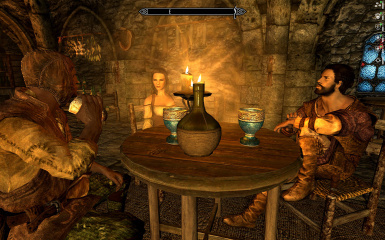 These meals get their flavor from Skyrim’s bounty: vegetables, wild game, wines, and the lands wide selections of mead. No vanilla items altered. No scripts. InsanitySorrow for some new food meshes and textures. Added second main file for Realistic Needs and Diseases users. Choose only one main file. The first one covers vanilla or iNeed. The second one is for RnD users. Raufin will be adding Nordic Cooking to the next Perkus Maximus blocklist. Nordic Cooking is about preparing simple, hardy meals that are low-sodium, tasty and nourishing. None of the recipes call for even a touch of salt. 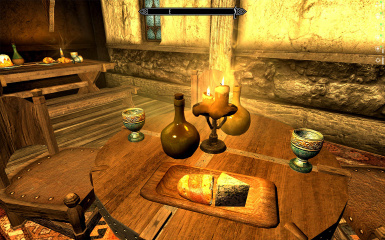 These meals get their flavor from Skyrim’s bounty: vegetables, wild game, wines, and the land's wide selections of mead. The careful combination of these local foods results in meals that will help you thrive in this beautiful but dangerous land. If you see this mod somewhere else, I did not put it there nor did I give permission to put it there. 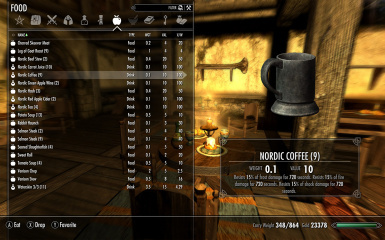 This mod uses vanilla good ingredients to create meals and drinks that give moderate but long lasting buffs to things like health, magicka, stamina regeneration as well as magical resistance, armor, night-eye, and so forth. The idea came from playing MMOs where the players have special raid food at the start of the raid giving a moderate boost to key stats and that last 30 minutes or more. I play on hard difficulty settings with lots of combat mods so a dungeon crawl is an challenge. Having a 30 minute buff to health, stamina and magicka regeneration helps a lot and makes sense in terms of immersion. The mod has no scripts and no vanilla assets were changed so it's compatible with everything. Recipes never call for more than three ingredients and salt is never one of them. I don't like having the track down salt just to cook especially since it's in the alchemical category and can be scarce at times. All food and drinks are created at any cooking station. 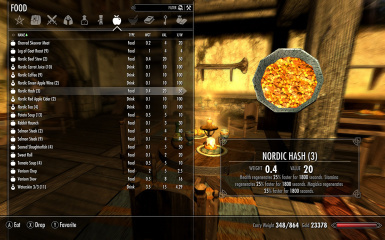 To keep clutter to a minimum, the individual recipes only display if you have the required items in your inventory. The items are common so you should see items popping up often without having to consult the cook book to go find them. There are many recipes but only a few meals. This means you can create a Nordic Cheese Soup with many different cheeses but all the recipes produce the same soup with the same buff. This keeps things simple and the clutter in your inventory bag down as well. All my crafted food and drinks have the Nordic as the first word to group them together in your bag. I included some vegetarian items for those role players who don’t enjoy the blessing that is charred meat. Internally all coding objects I created are prefixed simpleMods to make them easy to find if you want to alter something for your personal taste. 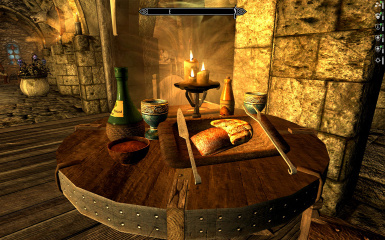 There is a recipe book (really a note for faster page turning) located in a player-owned container on the night table in the guest room of the Riverwood Sleeping Giant Inn. That container re-spawns so if you lose your copy and want another you can wait outside the cell for a few days and get another. Or use the console and type HELP “Nordic Cooking” to get the id of the book and type: Player.Additem TheBookID 1. The buffs are just a few to keep it simple. They are also moderate but designed for a high-difficulty game setting. I play on expert/master with a lot of combat mods. If you play on normal the buffs will seem a little OP but normal is so easy, you are already strolling through the game so a little easier won’t make a big difference. The idea came from playing MMOs where you eat raid food before a big fight for a stat buff that lasts 30 minutes or more. The food buffs are all 30 minutes and the drink buffs are 12 minutes. Health, Magicka, Stamina Regeneration: +25% for 30 minutes. Stews and Soups produce this effect. Health, Magicka, Stamina Regeneration: +15% for 30 minutes. Jerky, sandwiches and salads produce this effect. Fire, Shock, Frost resistance: +15% for 12 minutes. Nordic Coffee produces this effect. Poison resistance: +25% for 12 minutes. Nordic Tea produces this effect. Magic resistance: +15% for 12 minutes. Nordic Red Apple Ale and Nordic Red Apple Wine produce this effect. Armor Increase: +50 for 12 minutes. Nordic Green Apple Ale produces this effect. Nighteye Effect: 5 minutes. 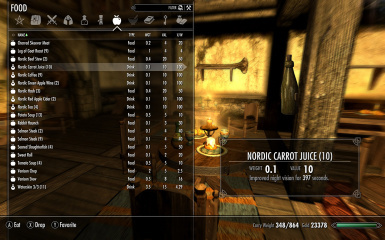 Nordic Carrot Juice produces this effect. Health, Stamina and Magicka Increase: 25pts for 12 minutes. Nordic Green Apple Wine produces this effect. Cure all diseases, Health Regeneration +10% for 30 minutes: Nordic Chicken Soup produces this. You can consume more than one item at a time for different effects but the same buffs do not stack. No vanilla items were altered so the general compatibility is very good. Nordic Cooking won't hurt other mods or your save. The current version of iNeed supports Nordic Cooking so my meals will relieve hunger and thirst. Just download the main file titled Nordic Cooking. That's all you need for Vanilla or if you use iNeed. The file has no dependencies. iNeed supports food mods within its very clever scripting system. There is a second version of Nordic Cooking in the Main File Section for you. It has RnD as a dependancy and will satisfy hunger and thirst and support spoilage. If you use some other needs mod the meals and drinks will not interfere with them but likely won't affect hunger/thirst either. I use iNeed in my game and the latest version of it works great. Use your favorite mod manager. It’s just an esp and bsa file for your data folder. If you use Perkus Maximus, put this mod (NordicCooking.esp or NordicCooking_RND.esp) on the blocklist.txt so the patcher won’t include it. The patcher will make the buffs so short they won’t be worth it. The same likely applies to other overhauls that use SkyProc. I'm not sure if the blocklist.txt is case sensitive so match the case I provided. Raufin let me know he is adding it to the official blocklist.txt in the next update. Put any food/drink from this mod (they all start with the word Nordic) in a place that the game will delete (a dead body for instance). Wait until any buff from the mod is off. Check the Magic panel for buffs with the names starting with “Nordic” as in Nordic Beef Stew. Wait until any of those buffs time out. None last longer than 30 minutes. Deactivate or manually delete NordicCooking.esp and NordicCooking.bsa from your data folder. Due to the limits of the crafting system where you can’t use an AND/OR syntax in a recipe, you will see recipes with duplicate names but technically different ingredients. They have the same name because the food they produce is the same. The list of ingredients will appear to be the same but actually they are not. For instance there are two completely different items in the game with the name “Wine”. They only difference between them is the bottle. One has a wicker area around the base and the other does not. If I want to let you use either “Wine” to make the same soup, I have to have two different recipes with the same apparent ingredients. Add two different cheese wheels to the mix and the recipes would get very complex very quickly. Better to live with the duplicate cooking entries and just one soup product in your inventory as opposed to Nordic Goat Cheese Soup and Nordic Cheese Soup. May approach produces just the one soup in your inventory bag. Cleaned and error checked in TES5Edit. Thanks to Bethesda for the wisdom of letting us mod their brilliant game. I wonder how many thousands of additional copies of Skyrim have sold over the years because the game can be modded into new and interesting experiences. The Nexus Modding Community. This is a great place to enjoy games to their full potential but it’s also a great place to get advice and help from other modders. Some food meshes from InsanitySorrow's Resources were used. IS's contribution to this community should not be overlooked. I know my game would not be the same without his awesome work. Isoku for offering to include support for the food in his awesome iNeed mod. This mod is a Nexus exclusive. Contact me for permissions use my work in your work. A German translation has been done: http://www.nexusmods.com/skyrim/mods/71453/?